After four-and-a-half hours of arduous trekking on the hill slopes from Srinagar town in early May last year, I reached the temperate forest of Khirsu, an eye- catching yet lesser known hill station in Uttarakhand’s Pauri Garhwal district. From here, I saw a number of villages scattered across the downhill slopes in the pine and oak forests. Trekking further, I encountered a variety of colourful pheasants, including khaleej and koklass. But a more rewarding discovery was to happen the next day. “Walking in the temperate forests of not only Uttarakhand but the entire north-west Himalayas, especially during April and May, offers some unique and remarkable returns,” I was once told by I D Bhatt, a scientist at G B Pant Institute of Himalayan Environment and Development in Almora. His words could not be more true. Besides being ecologically important, the oak-pine-dominated forests provide some peculiar provisioning services, which include some delicious fruits. The Himalayas are known to harbour over 650 species of wild fruits, but people in Uttarakhand mostly eat heesar, kingod, karonda, bedu, melu, timla and kafal. The next morning, I set off to explore the oak and rhododendron forests of Khirsu. To my delight I saw some kafal trees laden with berries. They are delicious, as the name itself reflects—ka + fal, meaning “what a fruit”. Also called box berry (Myrica esculenta), it is an evergreen, dioecious tree (male and female of the species are different). People prefer the female tree because it bears fruits that fetch a handsome price even in villages. Kafal tree is medium-sized and generally grows in the temperate forests of pine, oak and rhododendron between 1,000 metres and 2,200 m above the sea level under canopy trees. It grows across the Himalayan region, from Khasi, Jaintia, Naga and Lushi hills in north-eastern India to the Malaya, Singapore, China and Japan farther east. In north-eastern India kafal is called soh-phi. Walking in the forest, I cast my eyes around for kafal trees that had branches low enough to pluck fruits. Failing to find one, I picked up my pair of binoculars to soak in the beauty of the hills. I saw a girl swiftly climbing a tree to pluck kafals. Three women standing beneath were gathering fruits in baskets made of bamboo. I learnt from them that the fruit is part of folklore. One such story is about a woman who plucked a basketful of kafal fruits from the nearby forest and brought them home. The scorching summer heat had parched her throat. She asked her beautiful daughter for water. But there was no water at home. So the woman went to the spring nearby to quench her thirst and asked her daughter to watch over the basket, giving strict instructions not to eat the fruits. When she returned, the fruits looked fewer. Not realising that the fruits had shrunk because of loss of water, the woman slapped her daughter hard. The girl died on the spot and turned into a cuckoo. Ever since, every year in May and early June, the cuckoo sings, “kafal pako min nee chakho (kafal has ripened, but I have not tasted it yet)”. 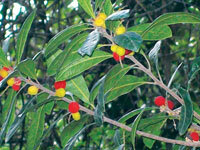 The popularity of the wild fruit is also reflected in a song famous in Uttarakhand: “Bedu pako baarah maasa, narayni kafal pako chait (bedu ripens every month, but kafal only in April-May)”. This is also a representative song of the Garhwal Rifles and the Kumaon Regiment. Savitri Devi, one of the three women gathering the fruits I had met, told me that people collect kafal for their own consumption and for sale. Looking at the tree and its high fruit-bearing branches, I noticed that collection is not an easy task. On many occasions, people slash down its branches, spread them on the ground and collect the fruits. The fruit’s maturity is confirmed when its colour changes from green to dark or blackish red. The fruits are gathered mostly by the women in villages. Since kafal grows in a specific altitudinal range, people living beyond it eagerly wait for kafal sellers. Earlier, people would exchange two bowls of pulses like gahath, masoor and urad for a bowlfull of kafal. On returning to Srinagar, I arrived in Balodi, a village that had almost no kafal tree. But I did see a woman selling kafal. She had walked down from a village close to Khirsu. She told me that one full glass of kafal, which may be around 250 g, costs about `15 in rural areas. Vendors sell kafal in local markets where the cost fluctuates, depending upon the availability of the fruit. In tourist places like Srinagar, Nainital, Pauri, Uttarkashi, Tehri, Almora, Karnprayag and Devprayag the cost of kafal is higher. It could be between Rs 60 and Rs 100 per kg. To get an idea of how much is a kg of kafal keep in mind that about 200 mature fruits weigh 100g. Delicious as it is, the tree is disappearing from the region for a number of reasons. Kafal is known to have a symbiotic relationship with nitrogen-fixing soil microorganisms. Nitrogen is used by plants associated with kafal. Disturbances caused by people around the tree affect the associated species and tree saplings, reducing their chances of regeneration. People cut down male kafal trees for fuelwood because they do not bear fruits. This severely affects pollination and regeneration of the species. “Kafal grows in relatively open canopy forests. It, therefore, prefers chir pine forests,” points out Bhatt. Chir pine forests are prone to frequent fires during summers. This is another reason for the declining population of kafal trees. 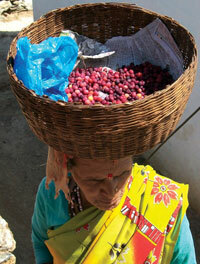 In the recent years, some parts of Uttarakhand have reported early fruiting of kafal. This has been attributed to climate change. The changing socio-economic and environmental pressures on temperate forests have led to a sharp decline in the availability of kafal trees. Apart from anthropogenic disturbances, there are natural reasons for the reduced number of kafal trees. Kafal is generally propagated by seeds but since the seed coat is impermeable, the physical dormancy remains, resulting in irregular and erratic germination pattern. This ultimately affects the species’ regeneration potential, and the new kafal trees have high heterogeneity in terms of male or female trees. This is not bad news for only the admirers of the tasty fruit. For a couple of years I had surveyed the vaidyas of Uttarakhand to document their knowledge on use of herbal medicines. During one such visit, I was informed that almost all parts of the kafal tree are used in one way or the other. The bark is used to cure a number of diseases, including mental illnesses. It is known to have anti-allergic property. The fruit itself is said to possess anti-asthmatic property. The fruit and bark together are used for making red and yellow dye. The oil extracted from kafal flowers and seeds is used as a tonic. Kafal leaves are a good fodder for cattle and its branches are used as fuelwood. The fruit is also used for making squash, syrup and jam. Despite its multiple uses and great potential as a fruit crop, the forest department does not select the species for its afforestation and reforestation programmes. That is why people have not yet started cultivating kafal as a crop. Economical, ecological and social importance of kafal does warrant a concerted effort to conserve the species. Village-level enterprises on kafal can boost rural economy. Processing the fruit for squash, syrup and jam can improve people’s financial condition. Beautiful n very informative piece.thanks Sir.